Clocks never interest me unlike watches. Maybe it was because that up until now, the clocks I've come to know were so plain and boring that I've always looked for an alternative route like putting my huge 27-inch display to good use for displaying digital time in a flip clock fashion. Like many others, I caught the popular flip clock fever. There's something unique and intriguing about the way a flip clock looks and works. 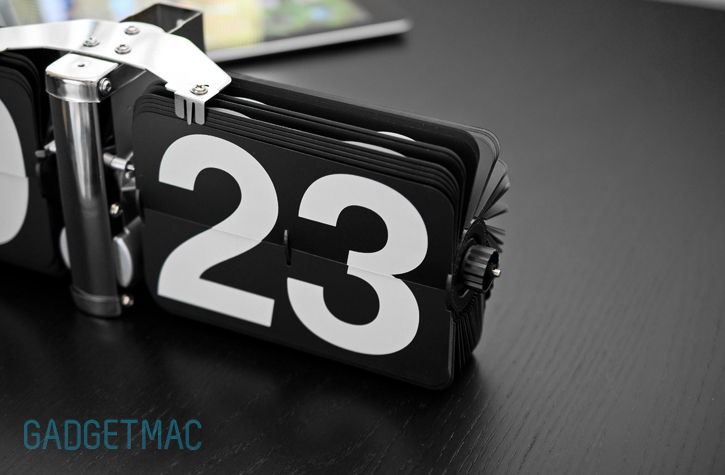 Thankfully, I can now let go of my virtual XouClock flip clock screen saver, iPhone and iPad apps for the real thing. This is the Giant Flip Clock from the people over at the Little Clock Shop. That's the place where you can get clocks that are anything but your run-of-the-mill, plain Jane clocks most of us have in our homes and offices. 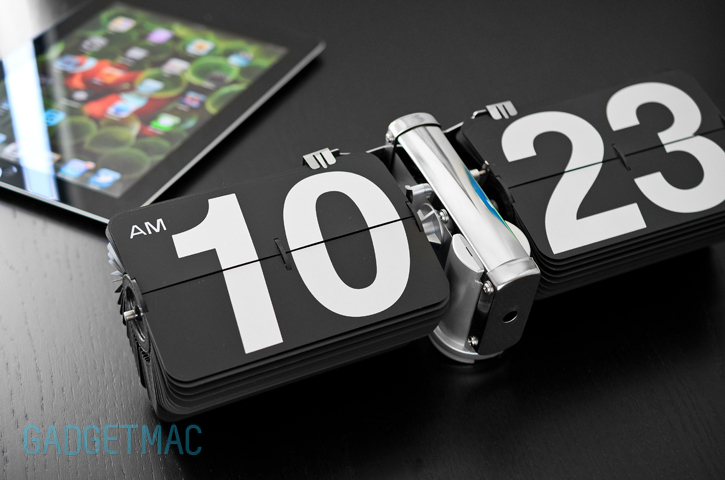 If you're a flip clock fan or just someone who wants to add a sweet gadget to their desk, this is the one-of-a-kind clock to get. 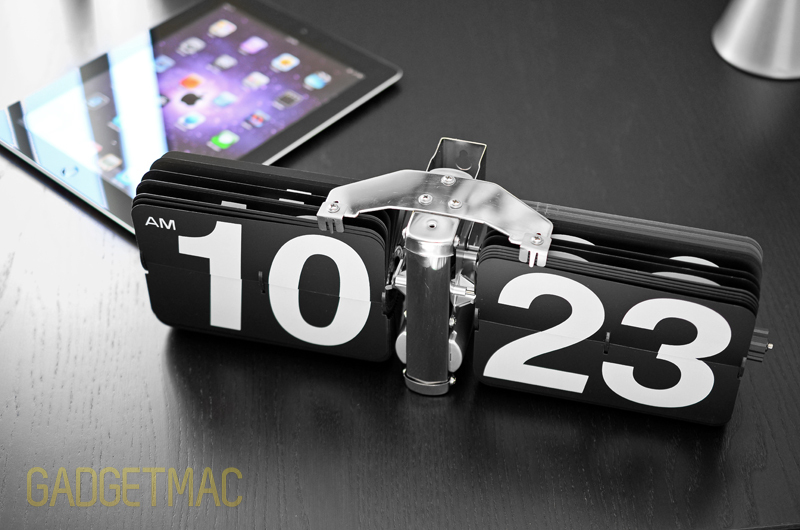 Out of the box, the Giant Flip Clock is ready to flip thru time and look ridiculously awesome on your desk. What if you don't have any room left in your workspace? 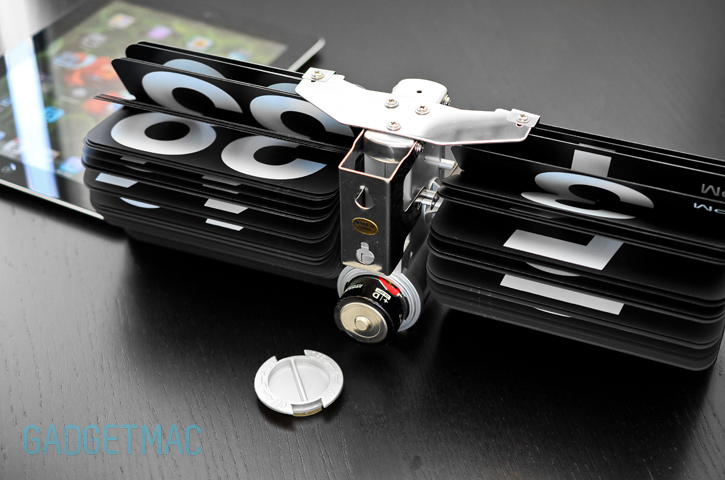 Well you can always mount the Giant Flip Clock on your wall using one of the two mounting brackets around the back polished metal frame that houses the clock mechanism gears. Before you can brag to your friends, you'll need to set up the time which turned out to be a tedious process depending on the current time and the time that has been set on the Giant Flip Clock you just took out of the box. Because of how this flip clock is designed to work, the gears inside can only spin towards one direction meaning you will have to spin thru and flipping all those plastic "leaves" until you get to the current time. It's also worth noting that it requires to set the minutes flip display one minute ahead of the current time to let the clock mechanism catch up for the first time which should after the initial set up, should tell time spot-on. That is if you've set it up correctly. A convenient turn-knob located on the side is used to adjust the time. To power up this bad boy you will need to use one big D-size battery as there is no option to connect this flip clock to a wall outlet to be powered on. Now this brings us to the first drawback with the Giant Flip Clock. While it may be cleaner to use a battery for the power source and completely eliminating even more cable clutter, the battery will only last approximately two months. So far my review unit is still going strong approaching one month. Flip clocks of this size aren't going to come cheap and will set you back $75. Granted you can pick a much cheaper clock to get the job done, but it's no giant flip clock that sits there telling time with bold, easy to read white numbers on a black canvas. Perfectly retro. You can also pick the Giant Flip Clock in a white variation with black numbers if you feel like changing it up a little. With that being said, the price doesn't match the build quality sadly. The Giant Flip Clock doesn't give the impression of high quality and does seem to be fragile. Each "leaf" flips and makes a clicking sound as you'd expect, however the cheap plastic gears inside make an annoying constant gearing sound that's most audible at night when things are quite. As someone who's pretty sensitive to clocks making annoying ticking sounds, the Giant Flip Clock couldn't stay with me in the same room when I'm trying to catch my sleep. If you're sensitive, I wouldn't suggest this as a bedside flip clock. Ticking noise annoys me at night, let alone the sound of gears turning had me wish this flip clock was more quiet. Good thing this doesn't come with a seconds flip display as well because I'd go crazy. The video down below is a little taste of how this flip clock looks and sounds when it flips time. Clearly flip clocks are being brought back into modern society with their retro yet cool moving digits. 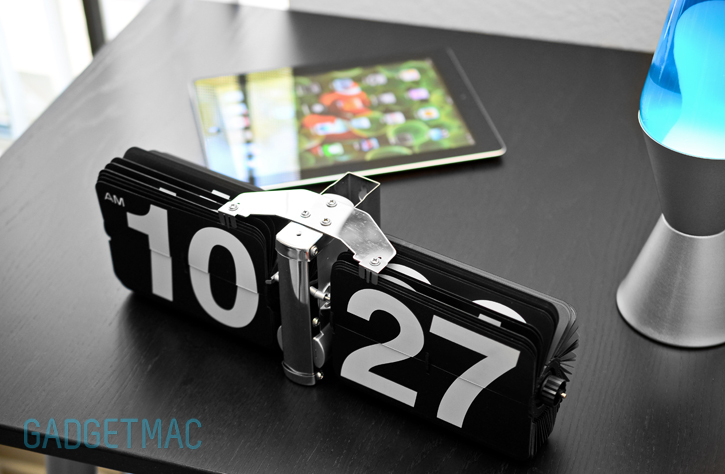 HTC's staple virtual flip clock widget that is put into HTC smatphones and tablets is a perfect example of how awesome flip clocks are over ordinary clock faces. The Giant Flip Clock displays time in modern digital digits but the mechanism that flips thru time right in front of your face is analog. I don't think I was this excited to watch a clock flip thru time ever since I finished with school. Having numbers flip down and magically change is very satisfying. You'll know when minutes and hours go by due to the audible flipping sound the Giant Flip Clock makes each time one of the many plastic "leaves" flips down into place. See it in action in the video down below. Taking into consideration that this flip clock is noisier than the average clock in quiet environments, I can't help but love every part of it. I'm no flip clock expert but the Giant Flip Clock has its drawbacks yet it makes you want to keep on using it. I know I'll be keeping it around for the long run because just look at it, it's flipping amazing. Update: We were told that the two month battery life span isn't correct and instead it should last for at least six months on a fresh battery. Obviously we cannot test that, but it sounds good.